Before we set up some kind of version control system we need to get some basic house keeping and organization out of the way. 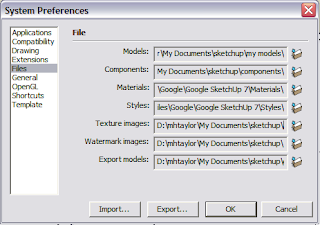 Do you know where all your SketchUp related files are? I'm not just talking about your model (*.skp) files; what about all your plugins, components, reference images, example models you've downloaded, materials, exported images, movie clips and movie projects, etc.? It's complicated enough if you only work on one machine but when you have two or more PC's that you run SketchUp on the problem becomes even more compounded. But before we even go there let's sort out your main machine first. Having all your models in one directory works if you only have a few models but for the average SU user it won't be long before this directory gets cluttered so think of a more granular directory tree structure that works for you. There's no one right answer as what works for me might not work for you so take a moment to think about how to logically arrange your working models. I categorize mine by subject; cars, buildings, furniture, etc. and put individual models into these directories. For bigger projects I may have that are made up of more than one model, for example my house models, a campus I'm modeling etc. I create a unique directory for each. These projects usually contain a master model that incorporates the other models but keeping a whole project isolated is useful for me. Outside my models directory tree I have a peer directory structure for my exports. My exports are any image files I create directly from SU or from a renderer from my models. They also include any animation clips I might create and any movie presentations I might create from those clips etc. I want these files to be accessible and related to my SketchUp models but I do not want them cluttering my modelling directories. On a par with this tree I also have a reference folder. Here I keep the images I may have personally taken or that I have downloaded from the interweb to help in creating a model - usually I end up with several reference images per model so this directory tree can contain more files and more granular directories than even my model directory. I also put models that I have downloaded from the 3D Warehouse here so that they don't get mixed in with my own models - these may be models I have downloaded to utilize in my own models, or just to see how they are constructed or purely for fun. Finally I have a peer directory to store all my components which I keep in the same area. By default SU sets this directory up closer to the program executables themselves but I prefer to have them closer to my working models etc. so that I can transport all of my working files from one machine to another easily. The same holds true for textures and styles etc. - in your SU files preferences you can set all these directories to be in subdirectories of you main SU working area directory. Take some time to get all your files together and organized. Next time we'll look at how you can utilize this work and these organized files across machines and use version control to keep track of your work.